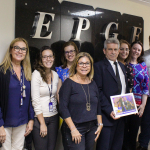 In May 2018, Mônica Rodriguez, representing the School, presented a picture of homage to the Getulio Vargas Foundation employee Francisco Almir Paulino Pereira. Almir is Administrative Agent in charge of the Headquarters Building and has worked at FGV since 1993, exercising his activity with excellence. Almir was one of the employees honored by the graduate students of the FGV EPGE at the graduation ceremony held on March 23, 2018.